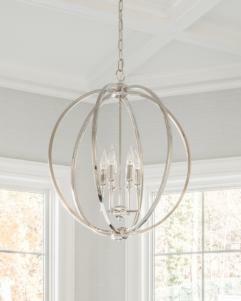 The modern orb silhouette of the Corinne chandelier is interpreted in two distinct ways. 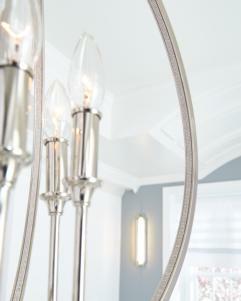 In Polished Nickel, it features an Inlay Crystal detail along the inner surfaces for dramatic sparkle. In Oil Rubbed Bronze, hammered inlay detail embellishes the inner surfaces to catch light for a more rustic aesthetic. The center candles are attached by a hub giving the illusion they’re floating.